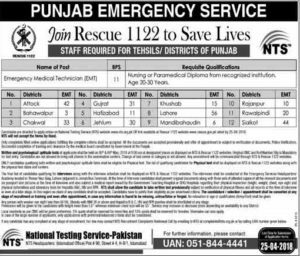 RESCUE 1122 EMT Jobs 2018, Application are invited for Emergency Medial Technician in Rescue 1122 Punjab For following Cities. 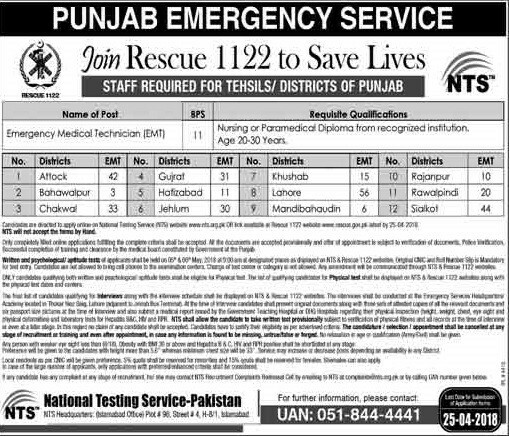 Rescue 1122 is a best government job in Pakistan. Qualification: Nursing or paramedical diploma from recognized institute. Jobs cities: Lahore, Attock, Bhalwalpur, Chakwal, Gujrat, Hafizabad, Jehlum, Khushab, Mandibhudien, rajan pur Rawalpindi, Sialkot. Send your Complete document to address below jobs advertisement.